THE POMPANO BITE IS HOT! CALL NOW TO BOOK YOUR TRIP WHILE OPENINGS ARE STILL AVAILABLE! NEW RATES – DONATIONS ONLY!NEW – ORDER FLIES FROM CAPTAIN GARY GILES! Captain Gary Giles is a licensed USCG Captain. He grew up in the Miami area, and has been fishing the inshore and nearshore waters of Florida his entire life. 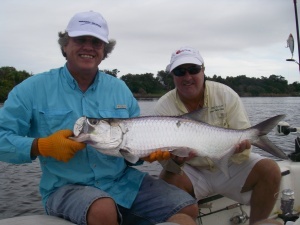 Capt Gary Giles is a scientific researcher for the study and migration of Tarpon, he also heads up the Tarpon tagging program, which he initiated, for the Sportfish Research Institute. Captain Giles produces the East Central Florida fishing report forFishBuzz.TV, and has been a Director, along with Capt. Rodney Smith, of the Hook Kids on Fishing Program. He created the World Skin Cancer Foundation Fly Fish Tournament. Captain Giles is proud to have been the Head Coordinator for the Ban the Nets conservation initiative within South Brevard County. He is sponsored by PrecisionPak,T.L. Johnson fly rod Company, Abel Reels Company, BioEdge Fishing Products, Norton Brass Rattler, RSCC Computers,Hall Em In Lures and Line & Lure Company of Georgia. Capt. Giles is also a member of the Pro Guide Team of D.O.A. Lures, as well as the recognized professional for Tarpon with the Bass Pro Shops, fishing with the Pros Educational Program. 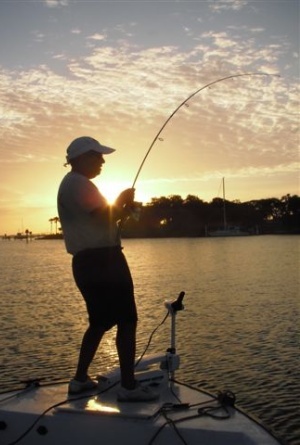 He possesses over 35 years of Fly Fishing experience, and over 25 years specifically within the Indian River Lagoon, inshore and nearshore, specializing in both light tackle and Fly. Just read what a recent customer said about his charter… “…I really appreciate all the effort you went to make our trips both sucessful and enjoyable. …You gave us opportunities on every trip to be successful and I know that takes alot of dedication, hard work, and skill to provide those opportunities. Thanks for several memorable excursions and we look forward to more with you in the future…” – Greg Shiver Dover ,Fl. Let Captain Giles provide you with a day on the water you won’t soon forget, a day of catching, not fishing. Call today, for rates and reservations, and “Prepare for Catching” with a premier charter experience.